Now retired; he was the immediate predecessor of Justice Kagan. His final year on the Court was 2009-2010. That's the first of the 2-year period we've been examining in this series of posts. So, if for nothing else but completeness, we'll look at Stevens record for that year. He was appointed by a Republican, President Gerald Ford. 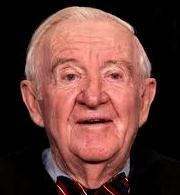 But over the years, Justice Stevens' voting became increasingly liberal. He eventually became the leader of the liberal wing of the Court. Stevens sympathized with the policy priorities and preferences of liberal Democrats on most issues, and his scathing dissent in Bush v. Gore was no surprise. In fact, that dissent actually mirrored others he authored condemning the rightward--and Republicanward--drift of the Court on many issues. Let's take a quick look at his record in that final year before he retired. Of the 12 highly partisan-charged cases decided by the Court in the 2-year period we've been examining in this series, 7 were decided during Stevens' final year. He voted the same way a Democratic politician would be expected to vote in all but 1. That's 86%. In that 1 exception, he sided with the conservative Justices on the Court, with business interests, and with the Republicans politicians in the Senate to deny the National Labor Relations Board the authority to resolve labor disputes with just 2 members. That is, unless or until the Senate confirmed President Obama's nominees to the Board. Otherwise, in those highly-charged cases involving issues of guns, religion, gay rights, campaign finance, and immigration, he voted with the other liberals on the Court--i.e., just like a partisan Democratic politician would have voted. What about that larger pool of ideologically-laden cases? Of the 60 we've been looking at, 32 were decided during Stevens' last year on the Court. He voted like a political liberal in all but 2. That's 91%. That makes his record at least as ideologically lopsided as that of any other Justice. As with the other liberal Justices, Stevens' voting was twice as restraintist as activist. That's a record of much more restraint than that of the conservative Justices. But as we've said in previous posts in this series, that's because most of the laws at issue were ones which liberals would generally favor and, thus, be expected to want to uphold. Stevens voted the way a partisan Republican would vote in 1 case. (That's the 14%.) That's more than any of the other liberal Justices did. But that's because they never did! In fact, he voted like a political conservative would in only 9% of the larger pool of cases. No one's record on the Court was less conservative. And, again, he voted like a judicial restraintist--i.e., deferring to the other branches and the states by upholding their choices--much more frequently than the conservative Justices did. Like the other liberal Justices, Stevens voted much like we would expect of a partisan Democratic politician. The contrast with the voting of the Court's conservatives could hardly be more stark. That's the same for Stevens' voting in the generally ideologically-laden cases. He voted overwhelmingly like a political liberal. Again, the contrast with the conservative Justices could hardly be more stark. Partisan: you bet; very much like a partisan Democratic politician. Ideological: you bet, extremely like a political liberal. Activist: not much, because most of the laws at issue were politically liberal. [For the posts in this series on New York Court Watcher that focused on the other Justices, see Supreme Court: How Partisan? Ideological? Activist? (Part 1: Focus on Scalia) --with graphs!, May 1, 2012; Part 2: Focus on Justice Kennedy, May 3, 2012; Part 3: Focus on Justice Thomas, May 6, 2012; Part 4: Focus on Justice Ginsburg, May 10, 2012; Part 5: Focus on Justice Breyer, May 14, 2012; Part 6: Focus on Chief Justice Roberts, May 18, 2012; Part 8: Focus on Justice Sotomayor, June 1, 2012; Part 9: Focus on Justice Kagan, June 11, 2012.